Brad, as I mentioned in my last response, Bengen found that SWR increases as equity increases from zero to 45% of the portfolio, flattens out, then drops off at 60% equity. So, portfolio allocation will affect SOR Risk, but the biggest impact by far is the withdrawal rate. Lowering the withdrawal rate, of course, is quite expensive. A 4% withdrawal rate requires that you accumulate 25x your annual retirement shortfall. Lowering it to 3.5% requires that you accumulate 29x that amount. A very safe 2% withdrawal requires that you accumulate 50x your annual shortfall. I feel like I'm missing something here. Putting 1% in your spreadsheet does not actually affect reality. So how and why would putting that into your spreadsheet increase your risk of running out of money? It seems like the simplest thing to do would be to model the worst case. At least that's something Excel would be capable of. Well, it is certainly true that putting anything into your spreadsheet does not actually affect reality and changing numbers in your spreadsheet won't increase your risk of running out of money -- unless you act inappropriately on the results of the spreadsheet. That isn't, however, what I said. When you plug 2% into your spreadsheet you are showing that a 2% ROR will work (or won't) with no sequence of returns risk. Of course, if you are spending from a portfolio, there is SOR risk. 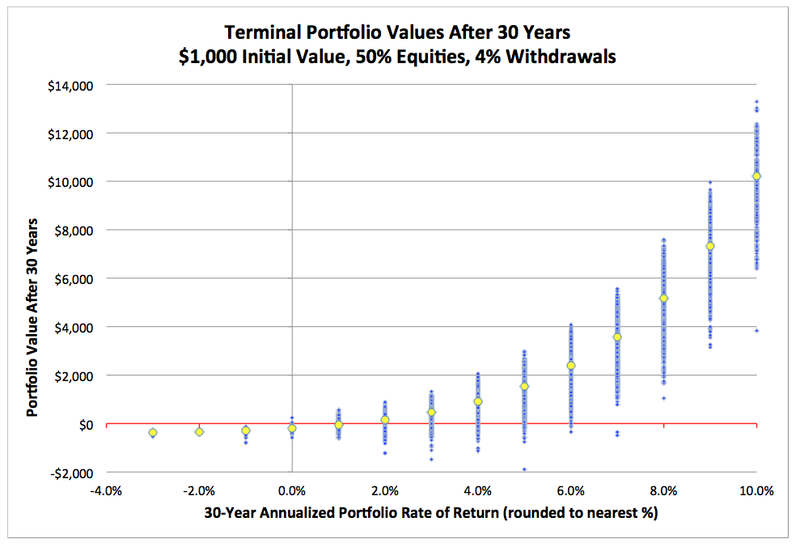 Due to SOR risk, your portfolio will actually fail about 30% of the time with 2% returns and 4% withdrawals. If you change that to 1%, even though your spreadsheet shows that it will still work "on average", it actually fails about 60% of the time, due to SOR risk. The point being that Excel isn't capable of modeling the worst case unless you randomize returns. Otherwise, you're ignoring SOR risk. Steve, perhaps this is a better way to explain? Which would you consider the worse case, experiencing a 4% rate of return on your portfolio and running out of money in retirement, or experiencing a 3% rate of return and successfully funding 30 years? I'm assuming you would consider running out of money to be the worse case, even though your portfolio return was higher in that scenario. So, which rate of return would you plug into a spreadsheet as the worst case, 4% or 3%? You might be tempted to say 4% now, but there are 3% scenarios that also fail. The point is that the worst case isn't a rate of return, it's depleting your savings. And that can happen across a fairly broad range of returns if the sequence of those returns is poor enough. Portfolio failure is usually a combination of poor to average portfolio rates of return and an unfortunate sequence of returns, meaning the worst returns arrive in the first decade of retirement. That isn't something you can plug into a spreadsheet without randomizing returns. Derek, you wouldn't have any SOR risk unless and until you started selling down the stock portfolio. And a spreadsheet calculation would be fine for that part of the plan. Even if you started selling the stock portfolio regularly after 10 years, you would have reduced lifetime SOR Risk significantly. You would then be looking at perhaps a 20-year remaining retirement, and as the SWR studies show, less time to spend means less SOR risk. I also am likely missing the point. If one does a Monte Carlo simulation with 10,000 scenarios, wouldn't lots of those scenarios reflect both poor return and poor SOR? If one has a 95% probability with a Monte Carlo simulation that one wouldn't run out of money, how does the 5% chance that you might run out relate to your discussion of poor returns & poor SOR? Can you be more concrete about how to think about this? What should feel 'safe' enough? The answer to your first question is “yes, lots would”. And the answer to your second question is that the 95% prior probability that you will run out of money is unaffected by this discussion. 95% is the estimate of prior probability before retirement begins and expecting your returns will be something like historical returns were; this post is about the conditional probability of failure at the end of retirement after you know that your personal returns were well below those expectations. We’re looking for a worst case. 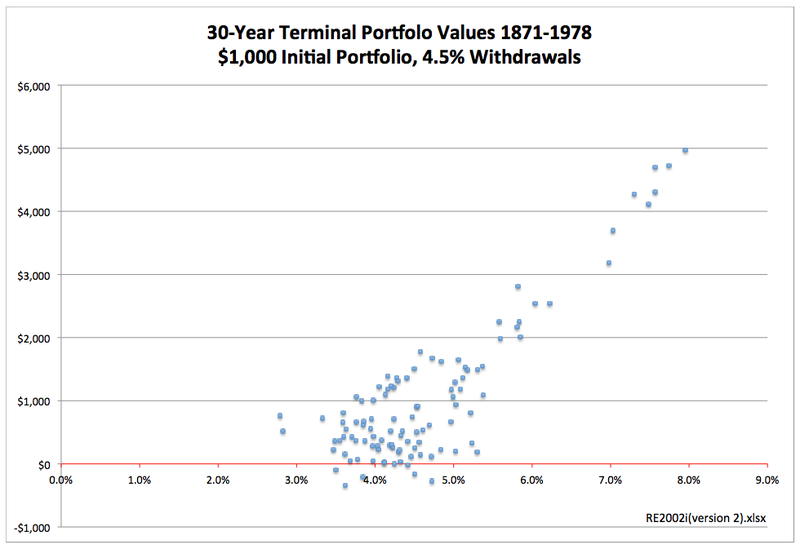 This is a discussion, as the title says, about SOR risk and spreadsheets, and specifically about attempting to find a single rate of return (a “hurdle rate”) to plug into the spreadsheet above which all scenarios always successfully fund 30 years of retirement and below which all scenarios fail to. In other words, it’s about trying to mathematically identify a worst-case scenario in a spreadsheet in terms of the portfolio’s rate of return. There are average rates of portfolio return below which you are unlikely to succeed even with a very favorable sequence of returns. There are rates of return above which you are likely to succeed even with a poor sequence of returns. But in between, there is a large range of rates of return that may succeed and may fail, depending on the (unpredictable) sequence of returns. Since SOR risk is unpredictable, it is not possible to pick a rate of return (like 2%) in that middle range of returns and say, “Here’s where failure starts.” The edge of portfolio failure isn’t a sharp line of portfolio returns, it’s a blurry cloud of probability. I believe the answer to your last question, when should you feel safe enough, doesn’t have an answer in the form of a non-randomizing spreadsheet or a single hurdle rate of portfolio return. But you’re also asking how to think about this. The way to think about it is that there isn’t a single rate of return that separates success from failure. SOR risk muddies the line. I think you should feel safer with a monte carlo simulation, which would tell you the probability of succeeding, or using a worst-case historical series of returns, though future returns might be worse, or (and I prefer this one) ensuring that you have a floor of safe income in case you lose the future-rate-of-return bet. Thanks for writing, and please respond if I’m still being unclear. Great article. So there is really no such thing as a 100% SWR. We just take our best shot at a SWR and hope that Lady Luck smiles on us. James, there is an important kernel of truth in your first statement, but we can do more than hope. It is true that, in theory, there is no 100% safe withdrawal rate. No one can promise you with certainty that your stock portfolio won't lose most or all of its value. People go broke in the stock market. That's why we call stocks and many bonds "risky assets". A major determinant of SWR is your spending rate. If you choose to spend 3% to 4% of your remaining balance annually, you cannot achieve a 100% level of safety over 20 to 30 years. 90% to 95% is about the best case you can argue. I personally find a 1-in-5 to 1-in-10 chance of going broke unacceptable, but that's my risk tolerance level and may not be yours. If you were to spend 1% a year, on the other hand, you could come quite close to 100%, but again, a stock portfolio will never be 100% safe. It would be expensive, too. If you needed to spend $10,000 a year from your portfolio in retirement and chose to spend 4%, you would need to save $250,000. At 3%, which is becoming the consensus SWR, you would need to save $333,333. To spend only 1%, you need to save a million dollars. In a very real sense, we do "just take our best shot at a SWR and hope that Lady Luck smiles on us" when we spend down a volatile retirement portfolio. But I recommend that you take several steps to reduce the odds of being unlucky, like diversifying into both risky and riskless assets, building a floor of safe income before you invest in a risky portfolio, and taking the smallest withdrawal you can. According to Kitces and Pfau I was under the impression that SOR risk could be virtually eliminated by picking a WR of say 3.5% and applying it to the previous year end balance (in other words not inflation adjsted) overlaid with a glide path strategy of starting retirement w/ a 25% equity portfolio that would increase 2% a year for the first 10 years of retirement. would love to get your opinion..
You have to start by understanding what SOR risk is. If you buy and sell stocks to save for and fund retirement annually for 30 years, there are 30 stock sales in your future when you retire. You don't know what stock prices will be in any of those years. Those unknown prices at which you will sell are SOR risk. So, the way to reduce SOR risk after retirement is by doing anything you can to reduce the amount of stocks you need to sell. 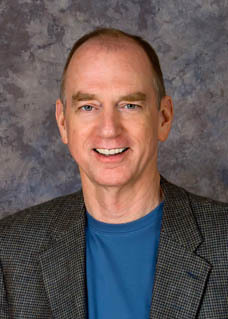 You could do this by selling less stock each year by reducing your spending, by decreasing your equity allocation so you sell fewer stocks and more bonds, by building a floor of non-equity income generating assets, or by any other method -- if you sell less stock in the future at prices you can't predict, you will have less SOR risk. Does reducing your WR from 4% to 3.5% reduce SOR risk as Michael and Wade suggest? Of course. Will it reduce it enough to save your portfolio? Time will tell. Does skipping inflation adjustments lower SOR as they suggest? Yes. Lowering spending of any kind will lower SOR whether you skip an inflation adjustment of skip a latte. As I wrote sometime back, withdrawing a percentage of current portfolio value instead of initial value also helps because it updates the information in your decision process with your new balance. Never ignore new information. By the way, a 10-year retirement has less SOR risk than a 30-year retirement, which is why Bengen said you could have a higher WR. You'll be selling less stock (a third) at unpredictable prices. So, not living long reduces SOR risk, though you might prefer to go with the lower equity allocation for non-financial reasons. But does it "virtually eliminate" SOR risk? That's a leap of faith. To virtually eliminate SOR risk, you need to virtually eliminate stock sales. Thanks for the reply Dirk. Kitces also suggestions a valuation approach to controlling SOR risk where equity allocation in retirement is a function of the then current Shiller PE Ratio. Undervalued 65% equity weighting, fairly valued 45% equity weighting, overvalued (like today) 30% equity weighting. He believes that Shiller PE ratio is a lousy short term indicator but a pretty good long term (10 years+) indicator. Do you see any value with this strategy vis a vis controlling SOR risk? Sorry, see my reply below. Not a lot. I do agree with Michael (and Shiller and Bernstein) that CAPE is a long-term valuation measure and not a timing mechanism. To quote Bernstein, once you have a reasonable asset allocation, tweaking it in one direction or the other doesn't make a lot of difference. (That's why he talks about asset allocation in dollops and smidges and not percentages.) SOR Risk is fairly constant, all other factors being equal, as a function of asset allocation from about 35% to 65% equities. Michael's is a theory. And one that would be very hard to prove going forward. I learned so much from your articles. Thanks, Tom! It's a win-win. I learn a lot from writing them. I am not one of the DivGrowth die hards, but I do agree with them that taking your cash draws from dividends (instead of/also from capital gains) is a pretty sure bet you never run out of money - regardless of sequence of returns. I have modeled the retiree who takes a wd%rate = the S&P's dividend yield in year one, and increase the $w/d by inflation. That never failed. I have also modeled the retiree who takes a wd%rate higher than the index's yield in yr 1, assigning him the yearly return of the yield-decile that would have yielded the necessary $$. This also rarely failed. The only failures was for retirees of the late 1960's. And the failure was caused by inflation, not sequence of returns. I'm not a fan of the strategy, either. I don't doubt your findings, though it is always possible to look at historical data and find some strategy that would have worked. That doesn't mean it will work in the future. Our historical data on stock returns is extremely limited. SOR Risk is primarily a function of the percentage of your current wealth that you spend. It doesn't matter if you spend less because you set a lower spending rate, because you spend a percent of remaining portfolio value instead of a constant dollar amount, because you reduce taxes, because you've paid off the mortgage, or because spending only dividends results in lower overall spending. A buck not spent is a buck not spent. Both swap SOR Risk for variable income. Now, is spending only dividends the best way to ensure that you spend less when your savings dwindle? I don't think so, because that strategy will increase dividend-paying stocks in your portfolio disproportionately. It's an interesting argument, though. Thanks for writing!